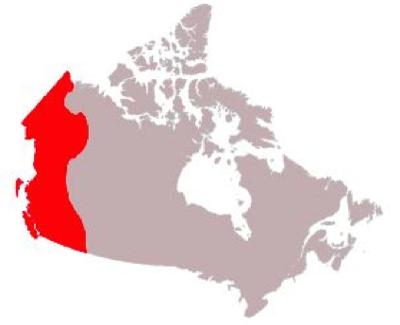 The Cordillera is located on the west coast of Canada and includes British Columbia, the Yukon, southwest Alberta and part of North West Territories. The climate of the Cordillera's coast is mild, wet and rarely has snow that stays. The interior of the Cordillera is usually colder and dryer with larger amounts of snow. In the summer, it is warmer and there is less rain. The landscape of the Cordillera has long chains of high rugged mountains. This includes the Rocky Mountains and the Coastal Mountains. Parts of this region are covered with forests. The natural resources of the Cordillera are forestry (this is the biggest industry in the region), agriculture, mining (iron, lead, zinc, silver, copper and nickel) and fisheries (the west coast is famous for salmon). There is lots of great farmland in the Cordillera. The Okanagan (above) is famous for its fruit and wine. Forestry is a huge part of the economy in the Cordillera as it is famous for its large forests. The Cordillera is rich in many different types of minerals, making mining a large industry. The fisheries are a large part of the economy with fish from this region are famous around the world. 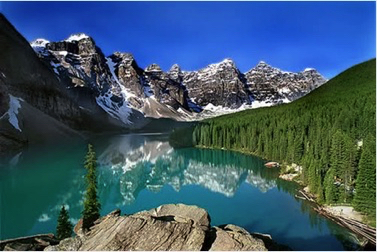 Most of the people in the Cordillera live in extreme south lowlands [Vancouver] and southern plateau due to the warmer climate. 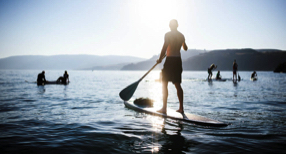 Bathed by warm, moist Pacific air currents, the British Columbia coast, indented by deep fiords and shielded from the Pacific storms by Vancouver Island, has the most moderate climate of Canada's regions. Vancouver Island's west coast receives an exceptional amount of rain, giving it a temperate rain forest climate. Although it does not contain the diversity of species of a tropical rain forest, the island's west coast does have the oldest and tallest trees in Canada: Western Red Cedars 1,300 years old and Douglas Firs over 90 metres high. From British Columbia to just east of the Alberta border the land is young, with rugged mountains and high plateaus. Signs of geologically recent volcanic activity can be seen in Garibaldi Provincial Park in southern British Columbia and at Mount Edziza in the north. The British Columbia interior varies from alpine snowfields to deep valleys where desert-like conditions prevail. On the leeward side of the mountains, for example, a rain-shadow effect is created, forcing Okanagan Valley farmers to irrigate their orchards and vineyards. The Rocky Mountains, the Coast Mountains and other ranges, running north to south, posed major engineering problems for the builders of the transcontinental railways and highways. 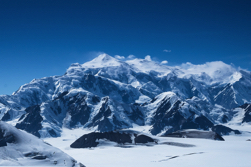 Canada's highest peaks, however, are not in the Rockies, but in the St. Elias Mountains, an extension of the Cordillera stretching north into the Yukon and Alaska. 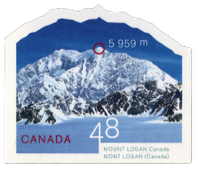 The highest point in Canada, Mount Logan, rises amid a huge icefield in the southwest corner of Yukon, the largest icecap south of the Arctic Circle.